Kopf’s big blunder(s) « Hercules and the umpire. 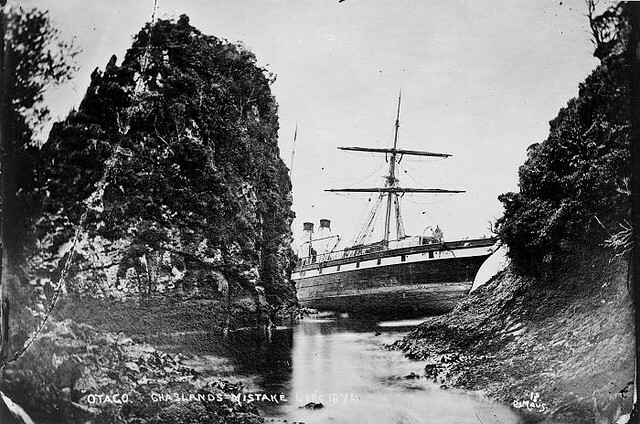 Photo Credit: De Maus Collection, Alexander Turnbull Library, National Library of New Zealand. Earlier, I said that I would blog about some of my screw-ups. I start that process with this post about a huge mistake that I made some three years after I became a federal trial judge. 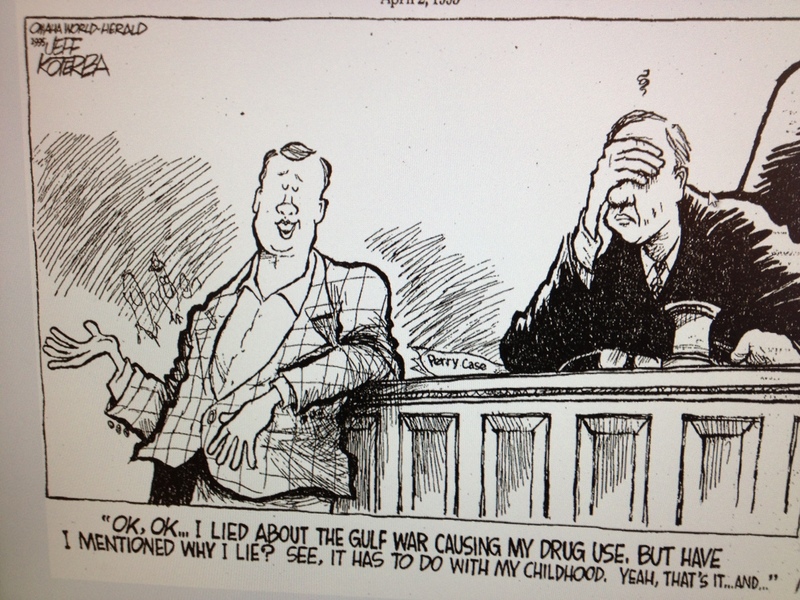 This big blunder revolved about an impassioned opinion explaining that a departure was warranted in a drug case because the defendant was a combat veteran whose drug dealing was caused by the horrible things he had witnessed. See United States v. Perry, No. 4:94CR3035, 1995 WL 137294 (D. Neb. 1995) (the Sentencing Guidelines are sufficiently flexible to take into account the indisputable impact of the cruelty of war on a very young man who suffered through horrific events as a crew chief-emergency medical technician on an Army air ambulance in the Persian Gulf War). There was only one problem. The defendant had appropriated the experience of another soldier, hoodwinking me and several others. When fellow vets who knew the true story heard about my touchy-feely decision, they contacted the press to straighten things out. Headlines, a blistering editorial, a scalding editorial cartoon (see below) and universal condemnation ensued. Sadly, all the criticism was justified. While I later corrected the error by sentencing the defendant to the prison term called for under the Guidelines, the damage had already been done. I had given aid and comfort to the nuts who attribute to federal judges every sin under the sun. More importantly, for the majority of citizens who are well-motivated, I provided a solid reason to doubt my judgment, and, by extension, the judgment of my colleagues. The saying “lower than a snake’s belly in a wagon rut” perfectly captures how I felt. “OK,” you say. “So what?” Aside from the considerable enjoyment that comes from another public flogging, what value does this post have to the study of the role of federal trial judges? “Quite a lot,” is my response. What follows are several lessons learned the hard way that inform my views about the proper role of a federal trial judge. First, the axiom that we learn by doing is especially (and painfully) true for federal trial judges. I came to the position with experience as a law clerk to a federal appellate judge, thirteen years of practice (including service as a special counsel appointed to prosecute the impeachment of Nebraska’s Attorney General), and then five years as a United States Magistrate Judge. Unanimously, the ABA committee that evaluates federal judicial nominees thought me “well-qualified.” Lesson One: There is no amount of experience that trains one for the job of a federal trial judge–absolutely nothing. The judge must learn his or her role by doing. Finding the proper role is very much a result of the slow process of accretion. Secondly, there is a lot of blather about doing “justice.” That is frequently code for giving someone a break not clearly called for by precedent or rule. Lesson Two: The more the federal trial judge strays from applying “law” to do “justice” the more likely it is that something unexpected will pop up thereby creating a good reason to question the legitimacy of a life-tenured and unelected judiciary. Finally, I have reread what I wrote in the Perry case. My analysis of the law, while approaching the outer limits, was correct. My grievous error was credulity–believing what the defendant said. Lesson Three: Skepticism is an integral component of the role of the federal trial judge. Empathy, while necessary, is overrated. George Bernard Shaw is reputed to have said something like the following: “A life spent making mistakes is not only more honorable, but more useful than a life spent doing nothing.” I certainly hope that is true for the blunder described above is merely the tip of my iceberg. Judge, unless there is more to the story that makes your blunder worse than described, it sounds from here like (1) you have been more critical of your error than you ought to be; and (2) therefore you have over-learned your lesson #2. It sounds like your error was just this: a mistake in judging credibility. An error, true, but hardly deserving of “universal condemnation” and self-condemnation (unless, maybe, everybody else in the courtroom was rolling their eyes at an obvious liar while you were being caught hook line and sinker). Somebody has to make credibility determinations, even though they are hard. Nobody gets them right all the time. So when you get to lesson #2, I am concerned that what you are saying more particularly MIGHT be “So the law ought to lean in favor of applying with less regard for individual circumstances, because sometimes factfinders err in finding what the individual circumstances are.” If that’s part of the lesson you learned, I think it’s the wrong lesson. Isn’t it just as bad to deny a variance or departure that is warranted, as it is to grant one that is later learned to have rested on an erroneous fact-finding? I sure think it is – and therefore if you are saying or thinking “credibility determinations are hard, so we should be more reluctant to grant variances and departures,” that’s counterproductive. Your concerns about lesson two are perceptive. You are quite right to worry that a judge will overreact to his or her mistakes and fail to do the right thing in the future for fear that the judge will repeat a mistake. Moreover, and as you suggest, I was not the only one fooled–medical folks at the VA were taken in as well. That, however, was (and is) cold comfort. Turning to the substance of your comment, I used lesson two to illustrate the tension between Dworkin’s Hercules and Robert’s umpire in the real world of the federal trial judge. By definition, Hercules is always right. The umpire, however, makes mistakes all the time as those of us who love baseball know. Deciding whether to credit someone’s testimony is very much like deciding whether the ball was in the strike zone. A rational umpire endeavors to mitigate against his mistakes by using a consistent strike zone rather than worrying about whether each call is correct. In other words, the umpire assumes that his errors will be evenly allocated between the pitcher and the hitter and everything will work out in the end. The umpire is more concerned with structure (the law) than results (justice). The problem with umpires doing “justice” is that the strike zone becomes fluid and ever changing. Among other vices, a fluid strike zone can result not only in a blown call in the last out of the ninth inning of game seven of the World Series but also in the crowd’s belief that the umpire threw the game. The foregoing is not entirely responsive to your comment. I intend to write more in the future. For now, know that I truly appreciate your taking the time to write. Pingback: The evil uniped and the earnest young judge « Hercules and the umpire. Pingback: A cautionary tale–one more thing on Kopf’s sucky sentencing instincts « Hercules and the umpire. Laurie my friend, thank you 🙂 Psalm 23 has taken on saepicl significance to me through the years. No longer is it just a passage to quickly quote, but it is a soothing balm, reminding me of just how much God cares.Very cool Jen! Another shortstop! I love it. Miss playing ball tons. The only chance I get to play on a team is at our church picnic each year. There’s nothing like swinging that bat and the ball connecting… I’m sure you know what I mean! Pingback: On being a dummkopf « Hercules and the umpire. How dare you call me subtle!